This course will teach the participant the basics of knife making with simple hand tools using bar stock. The student becomes familiar with tools required and understand the importance of heat -treating , develope skills in sharping and maintenance. FEE: $200.00 Canadian, this includes ; bar stock, handle material, heat -treatment , manual and consumables. This Course will introduce the student to the advanced stages of Custom Knife making and develope skills using specialized equipment to make a knife from bar stock into a uniquely handcrafted, functional cutting instrument. Requires sound knowledge of some basic techniques used in knife making. Individuals will acquire the skill of terminology, layout, design and craftsmanship to produce a uniquely handcrafted "liner lock" cutting tool. 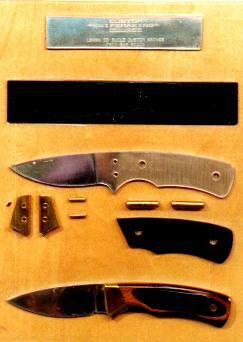 Students should have some basic skill in knife making. Damascus defined; The process of combining dissimilar metals, through the use of heat and compression. Students will learn to forge a blank from raw material (labour intensive). Understand the importance of color spectrum / to temperature variations. Participate will produce a multi layer knife blank only. DAYS: Most Weekends, starting late November through April (20hrs). FEE: $200.00 Canadian, this includes ; bar stocks, heat -treatment , manual and consumables. Address your suggestions, comments,and orders to "Cyber Blade"
This document may not be reproduced in any form by any means without permission of the publisher.Copyright �1992,1996 D.J.D.